So you probably burned out a key Portal for your advance at least once. I did it a lot and then used all that data to decode logic behind it, and here is how to not burn them out! So, when you hack a portal, portal goes to Cool Down period. That period is exactly 5 minutes or 300s. If you try to hack it before that period it will send you error message with additional time that you should wait to hack again. If you hack portal more than four times in the range of 4 hours it will go out to Burned Out state! Oh NO what I have done… but wait, there are tricks to it too. 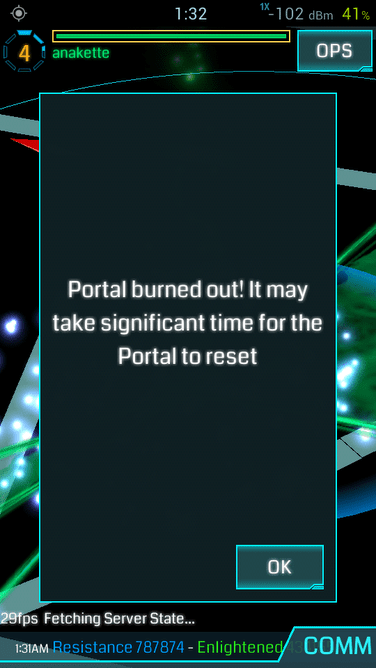 First off, when Ingress portal go to Burn Out state it will stay like that until end of that 4 hour cycle. So if you burned it out close to end of that cycle, portal will be back soon. If you are too pushy it will be burn out for almost all cycle. We are still not sure if cycle starts with your first hack, or the day is already divided on 6 cycles x 4 hours. We will update this info when we decode its logic. TIP: A WRONG STRATEGY! Lot of players are burning out portals intentionally, so that other players can’t hack it. This is wrong! Portal is burned out only for you, so there is no point in doing so. After all you are using your precious exotic matter (XM). So this is a bad strategy, and avoid doing it! Did you ever figure out if the cycle is fixed or begins with the first hack? It begins with the first hack! It really shouldn’t matter – no matter how often you hack it you will still have to wait four hours from the first hack. Is there some other advantage to waiting that I’m not aware of? I reckon hacking them quickly is more effective since you can then spend the rest of the time doing whatever you want wherever you want instead of micromanaging your hacking. hi, i have a portal located directly connected to my work space. i can hack it 20 time every 5 minutes. thats because the i an very rare and a rare multihack deployed. so that are 100 minutes in total to hack 20 times.i cant tell how long the burn out persists. based on the information given here i should be able to hack again today. i just tested it during i write this. i can confirm that after 4 hours the portal is not burned out any longer. so i can hack another 20 time. great stuff. i would highly recommend to download the app “integrated timer” from google play store. this app overlaps some clocks with your ingress so can start the timer when you hack without switching apps. afters the 5 minute period is over you will be alarmed by a sound and be able to hack as efficient as possible. you also can configure several timer such as “hack”, “burned out in x hacks”, “how much hacks left” and so on. so is it quicker/better to hack a portal 4 times quickly (20min) then come back after the 4 hours is up? what is a better to stay there and Hack it every hour? Definitely starts with the first hack. I even wrote an Android app to record my hacks and notify me whenever the 4 hours window is done and it works well ! Feel like sharing your app with the rest of the class? We find that burning out the portals quickly and then returning 4 hours later yields bigger drops on the post burnout farming if it is within the same 24 hr period. does it mean if i hack a portal once and come back 4 hours later i can hack it 7 times every 5 minutes? No, it doesn’t work that way. If it did, you probably could hack a portal you’ve never hacked before almost endlessly. REYTAN is right. He could hack, wait 3 hours 45 min and then get 7 hacks more or less in a row. This post seems not exactly right. When you try to hack, ingress checks if there were already 4 hacks within the last 4 hours and if so, you will get the burnout message. Might be a good thing to mention that dropping a multi-hack mod on a burned out portal will make it hack-able again up to the same number of hacks the burn out protection grants. It’s not clear that that portal burns out for you. There’s no ‘it’s burned out but someone else’ which is how this reads.